Roasted Garlic Spread - This rich cream cheese spread takes on a sweet tone from the addition of roasted garlic and currants. Spread onto crackers or bread for a simple hors d'oeuvre, or serve with raw vegetable pieces. In a medium bowl, macerate (soften by soaking) the currants in the brandy for 30 minutes. Drain well and return to the bowl. 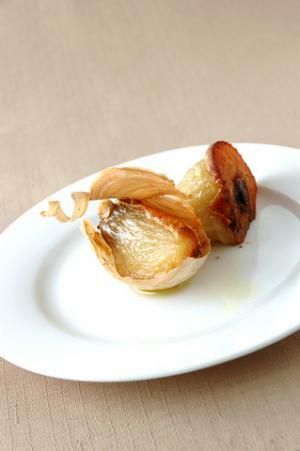 Squeeze the roasted garlic pulp from the heads into a bowl, taking care to remvoe any bits of skin from the pulp. Add the roasted garlic to the currants, along with the cream cheese and almonds. using an electric mixer, beat on low speed until all ingredients are thoroughl combined. Season with salt and pepe. Refrigerate for at least 2 hours before serving. Can be refrigerated for up to 5 days.